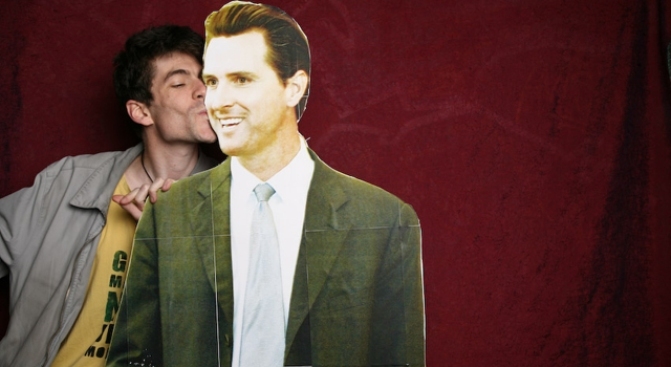 It's Mayor Gavin Newsom's birthday on Friday, do you know where your hair gel is? The time is now to dust off that crazy hold gel or to skip straight to the Krazy Glue because our friends at SF Weekly are hosting "Comb Your Hair Like Gavin Newsom Day" to celebrate the gubernatorial hopeful's 42nd year on this planet. Event organizers say the celebration will also have a scientific component. "Your participation in this experiment will, once and for all, answer the critical question that has plagued local social scientists and armchair political psychiatrists: Does combing your hair like Gavin Newsom make you behave like Gavin Newsom, or does behaving like Gavin Newsom induce you to comb your hair like Gavin Newsom?" the paper asks. And in a true homage to Mayor Newsom, the contest will be held entirely online. To participate simply send your pictures to the newspaper's Flickr pool, which ironically happens to be one of the few social networking site (of sorts) the mayor has not tapped into. Tip: we know the mayor uses Loreal to get that perfect every hair in place look and the coveted metrosexual title from talk show host Ryan Seacrest. Once you've snapped your scalp, you might as well compete in another online Mayor Newsom contest. The democratic candidate for governor is asking for help choosing a logo for his run to replace Gov.Arnold Schwarzenegger. There are six designs to choose from, all of which are suppose to reflect the change and reform the mayor says he would bring to Sacramento.